This game is another DC Comics edition and can be considered a sister-slot to Batman and Catwoman Cash by the same developer. The good news is this is no 'Dolly The Sheep' (clone) slot, with significant differences. There are original movie clips around the feature and smooth graphics and sound effects and the premium character symbols are stacked. You have a standard 5-reel 3-row format with 25 paylines. There is a 'turbo' button for the impatient to spin the game faster and a convenient autoplay setting which will stop at the feature trigger. There are non-multiplying Wilds on all reels and the scatters appear on reels 1, 3 and 5. On any losing spin the pink-jacketed Joker may appear, cackling hysterically and then he maniacally hurls between 1 and 9 Wilds at the screen, hopefully landing in the right positions to join the better symbols for a decent win. The Joker usually hurls 3 Wilds though, more is quite rare. he can be quite startling when he suddenly appears, so be warned! 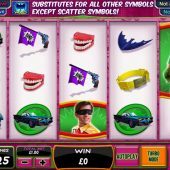 There are scatters on reels 1, 3, 5 and when landing all these you enter the Batman rr Joker spins. Select a character and there is a meter at the top of the reels. In the centre of this is a 1x value, and this goes in steps of 2, 3 and 5x then 'end' on the side of your chosen character, and the other side will have stages of 2x, 3x and 'end'. The spins are unlimited as there is an extra Wild on reel 3 which spins when landing, revealing an arrow which will point left or right and you will move one step in that direction on the multiplier meter. The value you reach applies to any wins on subsequent spins until the Wild appears again. Should you be on the maximum multiplier 5x for your (chosen) character or 3x for the other, if you move again in that direction you will hit 'end' and the free games finish. It's a piece of Joker irony that when you are on maximum multiplier and land the Wild on reel 3, you are hoping that the arrow will point in the 'wrong' direction and decrease the multiplier, as otherwise it's Kerpowww! and end of bonus! 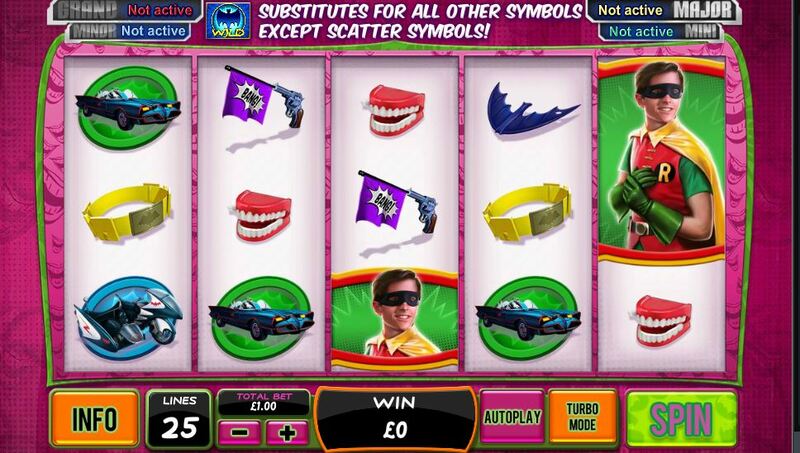 Joining the family of old-skool Batman slots is Batman and the Batgirl Bonanza slot and also Batman and The Riddler Riches, well worth checking out if you are into this sort of thing.